If you’re a foodie, you’ll know Thomas Keller. And if you know Thomas Keller, you’ll know about his restaurants in Yountville, CA. You may recall that I took a crazy drive up to Keller’s Ad Hoc in Yountville one Monday evening in an attempt to try his famous Buttermilk Fried Chicken, but later had to order Wagyu Tri-trip because we came the wrong day (They serve the fried chicken every other Monday). 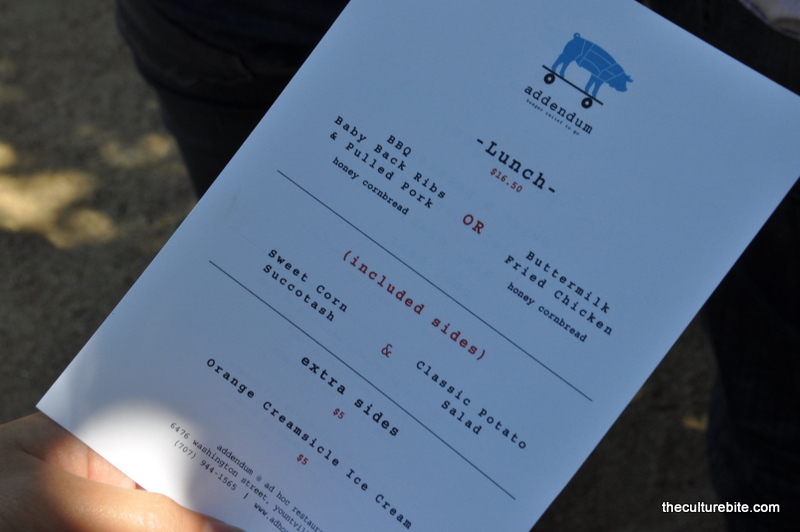 Anyway, Keller has since opened up a little shack behind Ad Hoc called Addendum which serves brown bag lunches in a to-go fashion. Here you can grab your order and eat at one of their picnic tables in their vegetable garden. I was excited to learn that his Buttermilk Fried Chicken is on their limited menu, and I’ve already been back twice to eat it. Before I get into the description of the meal, there are some rules you need to know. 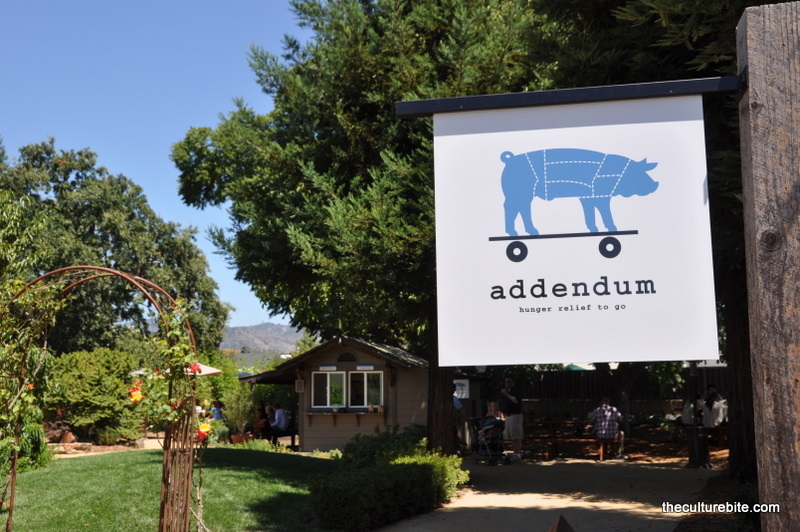 Addendum only serves 200 orders of the fried chicken and barbecued meats per day or until 2pm, whichever comes first. To help you gauge the time, I’ve come twice already and was able to snag the fried chicken at 12 noon and at 1pm. At 1pm, I was within one of the last 5 orders. They say you can call ahead and order 10 minutes before you pick up, but I’ve never had any luck getting through on the line. 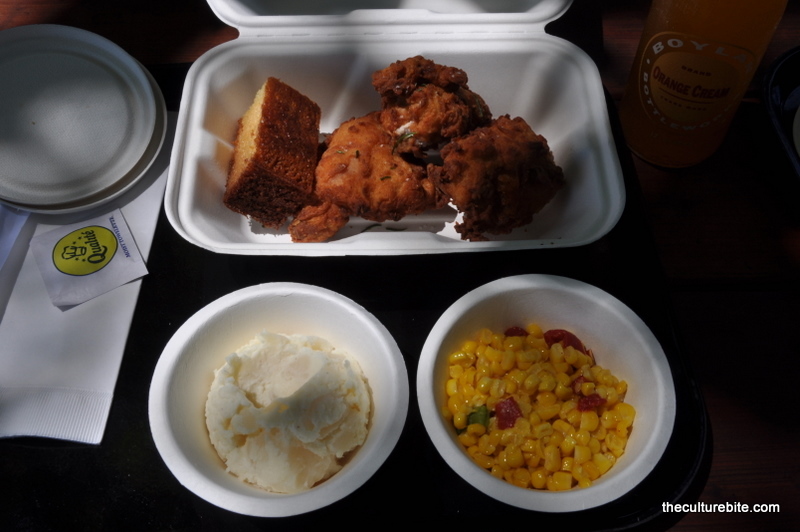 Each order comes with potato salad, corn succotash and a slice of honey cornbread. The potato salad is the best potato salad I’ve ever had. It’s kind of like a cool version of mashed potatoes. The salad was lightly seasoned and lemony; a great neutralizer for the fried chicken. The corn succotash was amazing! The corn and the roasted bell peppers were sautéed together until it became sweet, buttery goodness. Thomas Keller’s fried chicken is hands-down the BEST fried chicken I’ve ever had. It was perfectly seasoned and extremely juicy on the inside, two vital characteristics that are hard to come by. 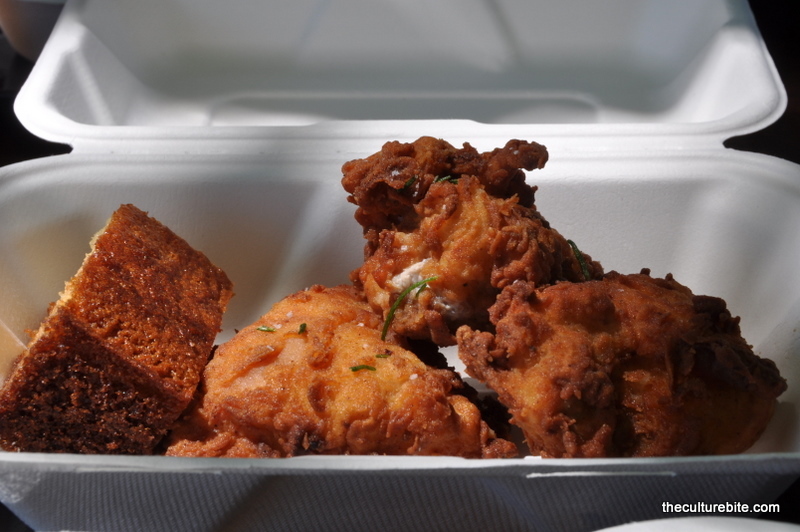 It doesn’t taste like yuppy fried chicken either (like the version from Wayfare Tavern). It tastes like good ol’ Southern fried chicken. I’m thinking Keller uses abnormal chickens that are injected with juice because I have never had a chicken so juicy (kidding about the abnormal chickens). It must be the 12-hour lemon, honey and herb brine that makes this chicken drip with juices. Even with the moist center, the skin is still very crispy too. Each order receives 3 small pieces which are surprisingly very filling. My brother made this fried chicken before using the Ad Hoc: At Home cookbook and his was pretty much on par. I asked the server if there were ingredients left off of their recipe and they said no. Nonetheless, I know Addendum makes some amazing fried chicken most of the time, so take my advice and come early!